“Haptic” SDJ – Out Now! 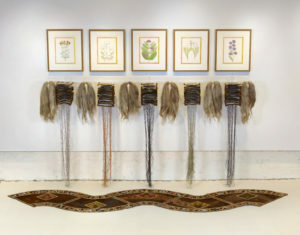 “Sensing Narratives” by Francesca Rodriguez Sawaya examines how approaches to weaving have evolved over the years and how we use weaving to preserve knowledge and personal narratives throughout history. Francesca Rodriguez Sawaya Quipu 2016, wood, yarn, thread, conductive thread, 181⁄2′′ x 25′′. 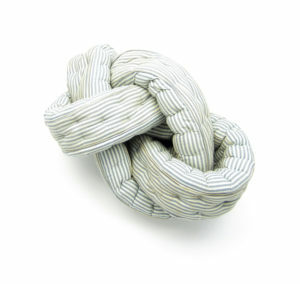 “Do Not Touch” by Freddie Robins explores the therapeutic benefits of knitting through the lense of three different artists. Freddie Robins … dances like 2017, wool, cherry wood, machine-knitted. Photo: Douglas Atfield. 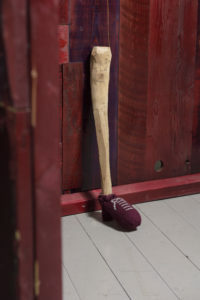 In “Domesticated Ghosts: The Art of Kaiya Rainbolt,” Kerianne Quick spotlights how Rainbolt manifests physical and psychological experiences of trauma and post-traumatic stress related to childhood sexual abuse through sculptural objects. Kaiya Rainbolt Confusion 2014, fabric, foam, thread, 12′′ x 7′′ x 7′′. Photo: Seth Papac. “Hidden Threads: Fungal-Plant Partnerships” by Lindsay Olson grows out of her scientific research of mushrooms and fungi through partnerships with Illinois Mycological Association and The Field Museum of Natural History. Lindsay Olson Hidden Threads: Fungal-Plant Partnerships 2017, thread, acrylic, beads, cotton, silk fabric, linen canvas, watercolor, ink, paper, embroidered, beaded, quilted, painted, 145′′ x 79′′ x 42′′. Photo: Cindy Trim. 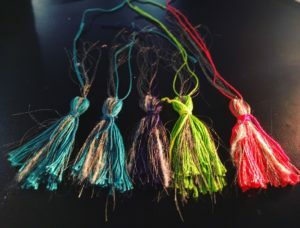 Fiber in Film: “Compendium: Textiles in Your Favorite Films” by Lauren Sinner features nine films where textiles take center stage as an integral part to the film’s concepts. 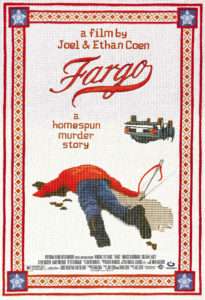 Fargo movie poster. Directed by Joel and Ethan Coen, Polygram,1996. Courtesy of A.F. Archive and Alamy.com. In The Studio: Vaçide Erda Zimic highlights the artist’s Peru-based studio and her intuitive practice, which revolves around material exploration, cultural heritage, and female relationships. Vaçide Erda Zimic Cartera Explosion 2018, felt, embroidered, 8′′ x 12′′ x 7′′. 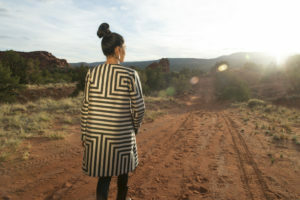 In First Person: David Naranjo’s fashion pieces are inspired by his Kha’Po Ohwingeh community, drawing from the landscapes, traditions, and symbols of Pueblo life. David Naranjo Po Ta (Marked Trail) 2018, silk, acrylic. Venue: Jemez Red Rocks. Model: Juanita Toledo. Photo: Kitty Leaken. Emerging Voices: Hannah O’Hare Bennett speaks to the importance of process and getting her hands dirty in her work. 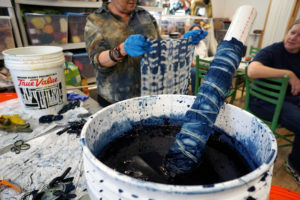 For Hannah, the transformation of cloth, thread, and paper pulp into a piece of art is a type of evolutionary process, especially for paper. 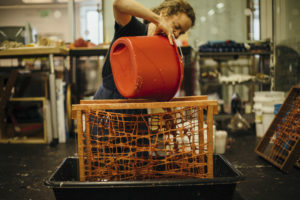 Pouring red ocher tinted abaca paper pulp over a sculptural paper piece during a residency at the Madison Public Library Bubbler, 2018. Photo: Jennifer Bastian. Spotlight on Education by Jodi Colella looks at FiberLAB, an independent study group that provides individual instruction, exposure to contemporary art, experimentation with materials and techniques, and membership in a maker community based in Somerville, Massachusetts. In Dialogue (new department!) 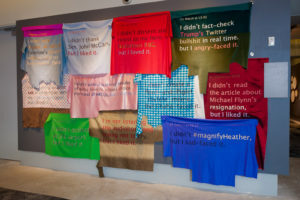 “Cardboard Fiction: the Work of Dosshaus” by Leora Lutz features a conversation with the collaborative duo of Zoey Taylor and David Connelly on their large-scale paper installations and what inspires them. Dosshaus Paper Thin Hotel 2018, mixed media installation. Corey Helford gallery, Los Angeles, CA. Images courtesy of the artists. Our In Review department also features articles on Making Change: The Art and Craft of Activism by Alison Gates and Lisa Oppenheim: Spine | Derrick Adams: Transmission by Jessica Hemmings. Jeana Eve Klein Recent Activity. 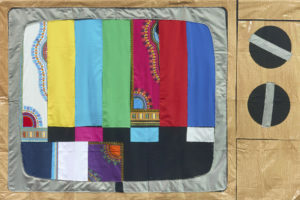 Derrick Adams Fabrication Station #10 2016, fabric collage, 48′′ x 108′′. Courtesy the artist and Vigo Gallery, London. 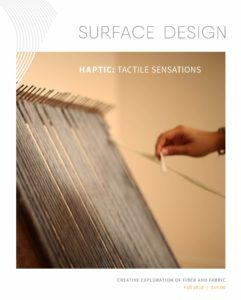 To buy a copy of “Haptic”, go to the SDA Marketplace, or you can check out a free digital sample on our SDA Journal page.